Where Worcester's significance to medicine and healthcare can be discovered. One hundred years ago, the 1918 influenza pandemic wreaked havoc across the glove, affecting the health of about one-fifth of the world’s population. It caused the deaths of approximately 50-100 million people worldwide; more than the estimated 16 million lives claimed by the First World War. The first wave of ‘flu appeared in the spring of 1918, followed by a more virulent second wave in the autumn, and a third wave in the spring of 1919. In total, it is estimated that the epidemic claimed around a quarter of a million lives in Britain. Approximately 1663 of these deaths were from the Worcestershire area. Whilst media attention and history books have focused on the victorious end to the War the tragedy of the Spanish ‘Flu has been wiped from our collective memory. Visit from January 2019 to view our exhibition about the Spanish ‘flu, supported by touring panels from the Florence Nightingale Museum. 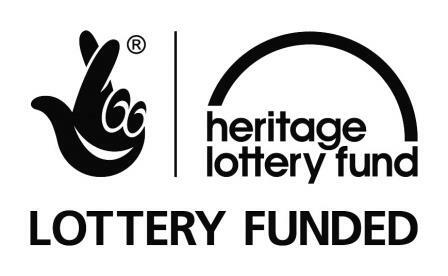 Click here to find out more of our Spanish ‘flu related activities, including a KS2 schools workshop and Study Day on Friday 5 April, 2019. Come along to view our small temporary display about the history of the Royal Army Medical Corps, which celebrated its 120th anniversary in 2018. With the help of one of our own volunteers, the display tells the story of Dr. Albert Ivor Morrison, and showcases some of his objects and photographs alongside the museum’s own collection. 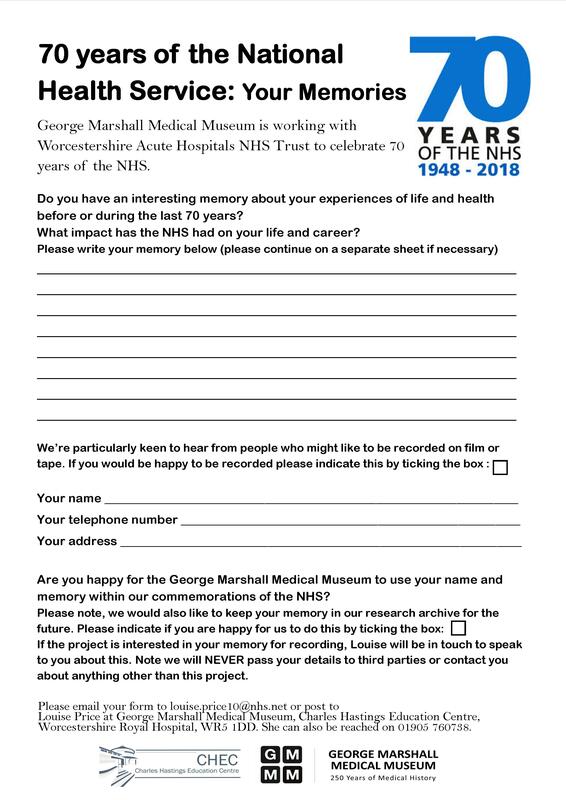 All displayed items have now been returned to store but you can still have your say about your NHS memory by downloading and returning the following form:- Click here to download. Sadly, you have now missed your chance to see rare plans from the archives and the George Marshall Medical Museum's copy of Florence Nightingale's Notes on Hospitals. The display about Florence Nightingale's impact on nursing and hospital design (and the changes which could have been implemented at Worcester Infirmary) has now been taken down. However, it was so popular, we have uploaded the exhibition interpretation for you, created by Volunteer Emily Cheetham: Panel 1 Panel 2 Panel 3. Click on this image to be taken to our online pages, specially created for this temporary exhibition. Click here to be taken to the pages created specifically for this temporary exhibition. Curated by two of our volunteers (one an Associate Member of the Worcester Royal Infirmary Nurses' League), we held a display about the League, including photographs of members, past and present, and information about the important fund-raising activities of its members. The Infirmary opens Monday to Friday 9am to 5pm and Saturdays 10am to 4pm. 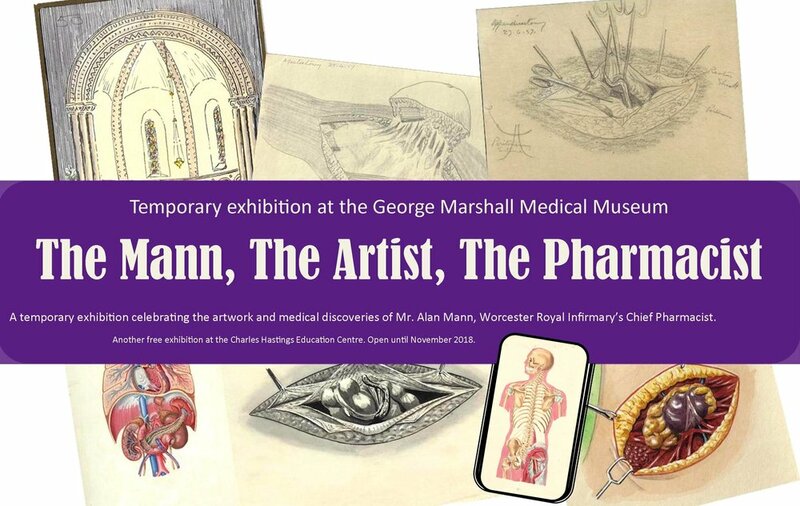 George Marshall Medical Museum opens Monday to Friday 9am to 5pm, except for bank holidays. Both venues are FREE and tours can be arranged by appointment and can open for visitors outside of usual opening times.